Let the magic of J.K. Rowlings classic Harry Potter series take you back to Hogwarts School of Witchcraft and Wizardry. Issued to mark the 20th anniversary of first publication of Harry Potter and the Prisoner of Azkaban, this irresistible Hufflepuff House Edition celebrates the noble character of the Hogwarts house famed for its dedication, patience and loyalty. Harrys third year at Hogwarts is packed with thrilling Hufflepuff moments, including the appearance of Quidditch captain and Hufflepuff heart-throb Cedric Diggory! With vibrant sprayed edges in Hufflepuff house livery, the book features beautiful house-themed cover artwork with intricate silver foiling. 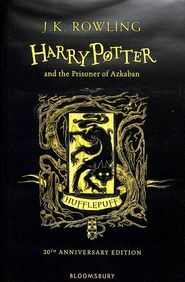 With an exciting, bespoke introduction exploring the history of Hufflepuff House, and exclusive insights into the use of the Patronus Charm by favourite Hufflepuff characters, the book also boasts a spectacular image by Kate Greenaway winner Levi Pinfold of Nymphadora Tonks conjuring her Patronus. All seven books in the series will be issued in these highly collectable, beautifully crafted House Editions, designed to be treasured and read for years to come. A must-have for anyone who has ever imagined sitting under the Sorting Hat in the Great Hall at Hogwarts waiting to hear the words, Better be HUFFLEPUFF!